We at Marshalls would like to wish all our readers a very good New Year and many happy hours of gardening. Let us hope that we do not see a repeat of last year’s storms that did so much damage from the wind and rain, which means you should mean much less tidying up, allowing you to get ahead with your plans for the year. Unfortunately we will see an increase in prices due to the pounds fall against the Dollar and the Euro, but the good news is that we have some Hayter and Viking mowers that we can sell at last year’s prices, as well as John Deere and Sanli mowers at very special prices. 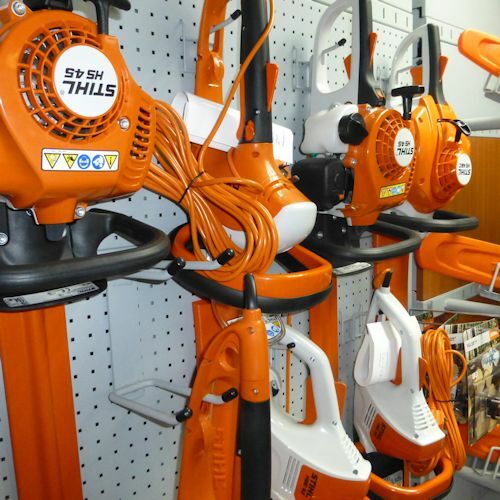 We have just refurbished our Stihl stands to enable you to see the full range of chainsaws, hedge cutters, power washers, Kombi system, trimmers and brush cutters. There are models to suit most small gardens up to the larger estates. To make life easy you can now purchase a ready mixed fuel for the 2 stroke engines which has a long shelf life and ideal to have in your machines over the dormant periods. Battery power is the way of the future. Stihl have 2 ranges one the Compact range which has a very powerful blower, Hedge cutter and a trimmer all costing £199.00 each as well as a 12” chain saw at £249.00. These prices include the battery and charger. The semi-professional range has more variety, including long reach pole pruner, hedge cutters quick cut saw, chain saws, trimmers, brushcutters, and lawnmowers All these machines use the same battery, so once you have purchased one battery and charger all you need to do is buy the carcass of your next machine. If you would like your grass to be cut without stress ….and without you, the Viking iMow is the perfect machine. Set up the cutting programme and you will not have to worry about grass cutting for the rest of the season. Come and ask for details. 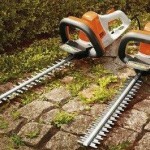 For a wonderful New Year present, we recommend the HSA25 cordless shrub shear. We have tried and tested it and now we always carry it around the garden for all the little tiding up jobs which now only take seconds, and with the extending handle the high jobs are made easy. We still have a few MS211 chainsaws with a saw horse and hatchet available, List price of the saw is £369.00. Our special offer is for £320.00 for the package. Finally, remember to organise your winter servicing just bring your equipment in or give us a call and we can arrange local collections.